This month, schools, organizations and communities across the U.S. are conducting events to mark National American Indian Heritage Month — and we are no different. Partnership With Native Americans (PWNA) looks forward to this annual observance and this year marked a celebration of Native American students and contributions, which concluded this week. We hope it helped to expand your knowledge and appreciation of Native history, heritage and education. We appreciate the many thousands of visits to our website, and would like to especially thank all of you who registered on our website or opted in for future updates. The winner of our grand prize, the now hard to find “American Indian Christmas” CD with beautiful and inspirational music is by Lumbee artist Jana Mashonee, was Felicia H. (location pending). Our Heritage t-shirts and hoodies, which make great gifts, may still be ordered! Visit www.RememberNativeAmericans.org/shirts and order by Nov. 24! 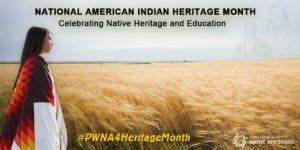 We hope you will continue to explore the significant and diverse impact of Native Americans on Western society and learn about life on the reservations PWNA serves. Follow PWNA on Facebook, Twitter and LinkedIn, or visit www.nativepartnership.org. This entry was posted in Grant Projects and tagged AIEF, college, education, Heritage Month, Native culture, scholarships. Bookmark the permalink. Trackbacks are closed, but you can post a comment.